Posted on Sunday, January 10th, 2016 at 11:32 am. When I met my (Taiwanese) wife I naturally became interested in the culture that had fostered and shaped her. When she introduced me to her Taiwanese friends I was immediately struck by something but I couldn’t quite put my finger on it. Then on our honeymoon in Taiwan our host sang folk songs to me late into the night, and all of a sudden the mystery was crystallized into music. I had never encountered such intensity and nobility of expression. That was the moment I fell in love with Formosa. This piece is my first attempt to incarnate that memory into a full-fledged composition. While the structure and melodic material is from the Taiwanese folk song “Ti O O,” I have also inserted my own ideas and inherited musical language while seeking to exploit the virtuosic possibilities of the violin. 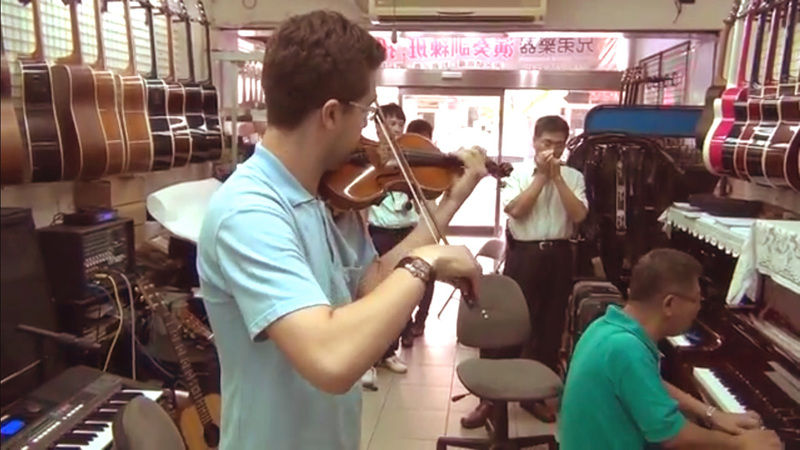 We at TaiwaneseAmerican.org hope that Charles will start a Taiwanese folk song performance series! Hear that, Charles? But in the meantime, check out some additional music by him. This is a video recorded from a jam session with a guitarist (李詠霆) whom he met in a music store (Chia Yi Brother Music 兄弟樂器) that he stumbled upon when he was wandering the streets in Chia-yi! Charles Morey was born in Fayetteville, West Virginia and began playing the violin at the age of two. Leading a diverse musical life as violinist, composer, arranger, conductor, and teacher, he concertizes extensively throughout the USA, Europe, and Asia, in such halls as Musikverein, La Scala, the Kennedy Center, Severance Hall, and Carnegie Hall. He has performed as soloist with numerous orchestras, including the River Cities Symphony Orchestra, Seneca Chamber Orchestra, Marshall University Symphony Orchestra, Cleveland Institute of Music (CIM) Orchestra, Lexington Bach Festival Orchestra, and the West Virginia Symphony Orchestra. 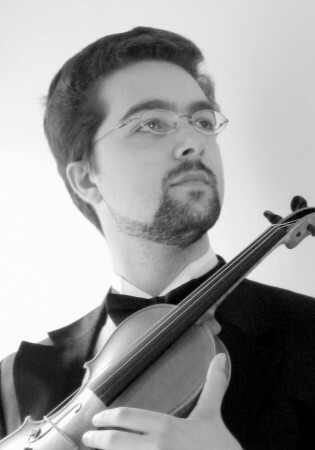 In the Spring of 2009, Mr. Morey won CIM’s concerto competition, performing Prokofiev’s Violin Concerto no. 2. He was also a prize winner in the 2009 Annual Milhaud Performance Prize Competition. As concertmaster, he has performed with orchestras such as the San Antonio Symphony, Omaha Symphony Orchestra, Memphis Symphony, Canton Symphony Orchestra, and the Lexington Bach Festival Orchestra. Also a composer, in February 2011 he made his Kennedy Center debut performing his own composition, “Images,” for violin and piano. He has also performed his own set of variations on the tune “Wondrous Love” with the West Virginia Symphony Orchestra, with an orchestral accompaniment by Artistic Director Grant Cooper. Mr. Morey received his Bachelor’s and Master’s degrees in violin performance from the Cleveland Institute of Music where he was a student of William Preucil. A recipient of the Bock scholarship, he was chosen in 2010 to study in an orchestra leadership program at the Music Academy of the West under San Diego Symphony concertmaster Jeffrey Thayer. He is currently a member of the first violin section of the Indianapolis Symphony Orchestra and a frequent substitute violinist with the Cleveland Orchestra. Previously held positions include concertmaster of the Ashland Symphony, Solon Philharmonic, Suburban Symphony, and section positions with the Canton Symphony and Rochester Philharmonic Orchestra. Recent honors include collaborations with composer Augusta Read Thomas, premieres of works by Michael Schelle and Dolores White, and a duo performance for Bronislaw Komorowski, President of the Republic of Poland. Taiwanese Aborigines Culture Tour throughout America World Premiere: Music Video for “Alishan” from the Island X Album Hello Taiwan Concert and Food Bazaar in NYC Happy Mid-Autumn Festival! Celebrate Friends and Family!